Francesco DiNezza first appears at Painesville, Lake County, Ohio, in 1909. When Francesco immigrated to the United States, Painesville, Ohio, was his destination. Francesco DiNezza, son of Domenico DiNezza and Carmina Mainella, was born on Tuesday, June 30, 1874, at Frosolone, Isernia Province, Molise, Italy. Francesco married Angela Mezzanotte, daughter of Donato Mezzanotte and Saveria Tartaglia, on February 11, 1897, at Frosolone, Italy. Francesco DiNezza immigrated to the United States on May 20, 1909, at age 34, travelling to Painesville, Lake County, Ohio. He was joining his brother-in-law, Domenico DiCristofaro, in Painesville. Domenico’s wife was a Mezzanotte. Francesco’s son, Domenico Antonio DiNezza, joined Francesco in Painesville, Ohio, in 1914. Mr. DiNezza may also have been related to Painesville Italian Felice Antonio DiNezza. 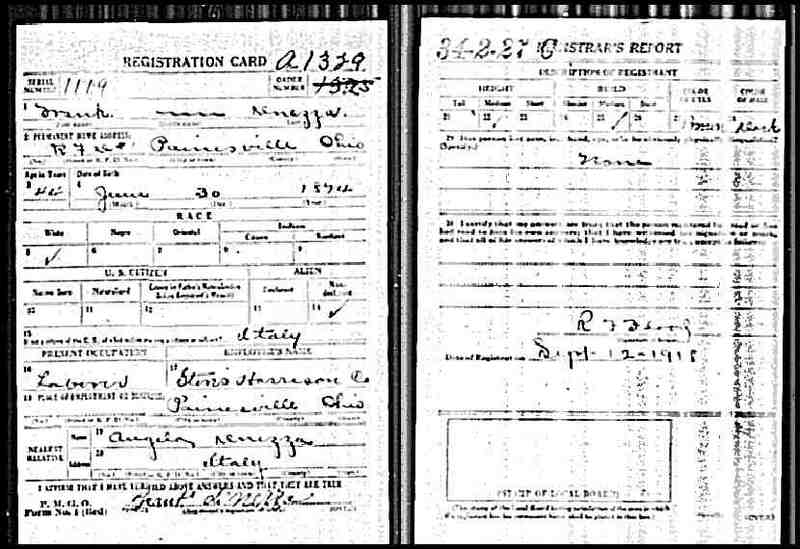 Francesco DiNezza registered for the World War I Draft on September 12, 1918. He was living at Painesville Township, Lake County, Ohio. Francesco was employed by the Storrs and Harrsion Nursery in 1918. Francesco probably returned to Italy after World War I. 1. Maria Carmina DiNezza was born on Friday, November 26, 1897, at Frosolone, Isernia Province, Molise, Italy. 2. Domenico Antonio DiNezza was born on October 14, 1899, at Frosolone, Italy. He married first, Josephine Mongello, in 1925. Domenico married second, Theresa Bauman Sziszak. Domenico died on February 26, 1977, at his home, 354 Sanford Street, Painesville, Lake County, Ohio, at age 77. His body was interred at St. Mary Cemetery at Painesville Township, Lake County, Ohio.